It was part of the large planned urban motorway network for the city - most of which has never come to fruition. The short version is that it was proposed in 1963, then sacrificed in 1975 on the altar of the Tyne and Wear Metro by the new Tyne and Wear County Council, although the line of the route was protected. It was one of the city's motorways that got the closest to being built - it was allocated the A695(M) number, and is mentioned in central Government documentation as routes where funding had been applied for. Indeed, the majority of the route ended up being completed, just to a lower standard. I see. 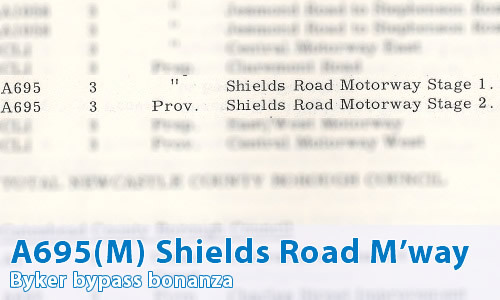 Could you tell me about the route of the Shields Road Motorway? It would have started at the junction of the Central Motorway East and the East-West Motorway, and indeed would have been a through route for the latter. The junction itself would have been located at the point where Durant Road and Newbridge Street meet the now-A167(M). Aha! So that's why that junction is so enormous? Indeed so - it explains the large gap between the carriageways of Newbridge Street. From there it would have followed roughly the line of Newbridge Street and Byker Bridge, before heading south of Shields Road before terminating at the roundabout at Union Road. South of Shields Road? Isn't that the A193 bypass? Indeed it is. That's the bit that's ended up as being built, although to a much lower standard than the three lanes each way motorway originally intended. Isn't the Union Road roundabout a bit of an odd place to end the motorway? Not really - it's a sensible location where traffic diverges. Still, it was planned to continue the route on from here - the Friars Goose Crossing. Yes, I can, on the relevant Might Have Been Map page.